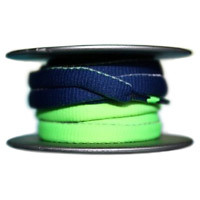 Shoelaces can be purchased with half one color and half another color. 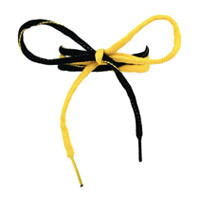 An alternative is to dye one half of a normal shoelace with a different color, or to use two half shoelaces of different colors. Any of these variations creates an interesting bi-color effect. • Begin straight across on the inside (straight section) and out through the bottom eyelets. • Run the knotted section straight across the bottom with the ends emerging through both bottom eyelets. 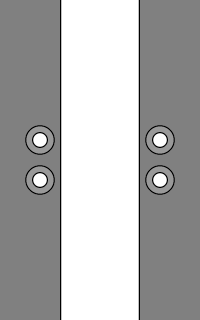 • Feed the un-knotted end of one half-length shoelace out through the bottom left eyelet and the other half-length shoelace out through the bottom right eyelet. 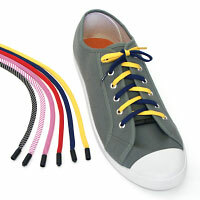 Where bi-color shoelaces are not available, an alternative is to use two half-shoelaces of different colors, either knotted together to form a full-length bi-color shoelace (as per variation 2), or each half tied off with a stopper-knot and fed separately through the bottom eyelets (as per variation 3). Nike Frees with Half & Half Lacing. Same Half & Half shoelace technique applied to Straight Bar Lacing. This page last updated: 28-Mar-2019. Copyright © 2004-2019 by Ian W. Fieggen. All rights reserved.